Islamorada Fishing, Deep Sea Fishing, Islamorada Sport Fishing, Sailfish, Charterboat Fishing in Islamorada FL Keys Captain Skye Stanley has fished from the docks of Islamorada and the Florida Keys all his life! Starting off on the â€œKalexâ€ Charter Boat with Captain Alex Adler at Bud â€˜nâ€™ Maryâ€™s Marina at the tender age of twelve he worked his way from â€˜swab to mate to captainâ€™. 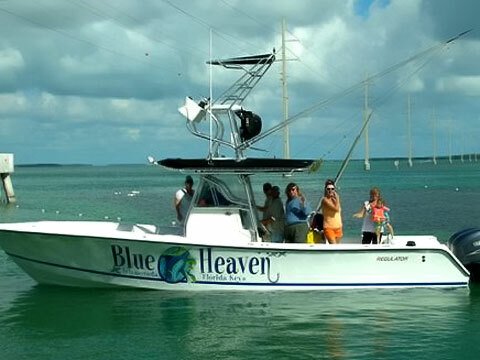 Today he is owner/operator of â€œBlue Heavenâ€ Charter Company â€“ featuring a rigged and ready 32 ft. REGULATOR Center Console offshore charter boat located at the World Famous Robbieâ€™s Marina. Home of the hungry tarpon where you can hand feed the fish and mix and mingle with the local natives. You can choose: *Offshore Angling *Wreck Fishing *Tarpon Fishing *Nearshore *Reef Fishing *Back Country *Family Fun Trips *Shark Fishing Whatever you may be looking for in a fabulous vacation experience! Depending on the season - Capt. Skye will take you out for blue marlin, sailfish, swordfish, dolphin, snapper, tuna, cobia, permit, tarpon, kingfish. For backcountry trips Capt. Skye fishes a 20 ft. ActionCraft skiff powered by a 200 hp Mercury for ease in navigating the shallow flats and channels. The catch of the day could be bonefish, snook, redfish , trout, permit, mangrove snapper, or goliath grouper. Capt. Skye has worked on every tournament level, from local back country kids tournaments to the international Billfish Release Extreme Tournament in the Caribbean. He most recently mated for Capt. Billy Knowles in the Islamorada Sailfish Fly Tournament in which the angler, Ed Liccione, won first place! For tournament information you can go to http://www.fla-keys.com/tdcfishingcalendar.cfm to check the schedule. Youâ€™ll enjoy his easy going manner, contagious smile and determined attitude to catch you a fish! CALL or EMAIL today to arrange the trip of your dreams! His local native connections will help you plan the best vacation you have ever had!